New Nook Touch to Have LED Flex Lighting for Night Reading? Last week an anonymous person left a comment on this blog saying that Barnes and Noble will be releasing a new Nook Touch soon and that it will use Flex Lighting. Thinking on it, given the timing and the circumstances, I would say the chances of Barnes and Noble releasing a new Nook Touch with Flex Lighting in the next few weeks is very high. In fact, I’d be willing to bet on it (any takers :)). In case you missed this video showing Flex Lighting in action, what it is is a thin LED lighting film that goes over the top of the E Ink display. It is supposedly invisible and doesn’t effect the clarity of the text in any way. The light can be turned on and off, and the brightness can be adjusted. The technology is also supposed to be energy efficient because only 1 or 2 LEDs are required for a 6″ screen. The Nook Simple Touch’s battery only needs to be charged once every 2 months as it is, so it’s likely not going to be much of a problem if adding a night light makes battery life a little less. The one thing E Ink ereaders really need moving forward is light. Electronic paper doesn’t generate its own light; it is a reflective display that depends on ambient light for illumination. That’s why E Ink ereaders aren’t suitable for reading at night without a reading light or lamp. And one of the main reasons color E Ink has yet to take off is the fact that colors appear too dull and washed-out without bright lighting. Add an LED light to the surface and it could make a big difference. No ereaders use Flex Lighting yet, or anything like it, so the Nook Touch would be the first. Several years back, when ereaders were first getting started, Sony released the PRS-700. It had a lighted screen, but used LED lights along the sides of the screen. The lighting wasn’t uniform and the screen was prone to reflections because of Sony’s old touchscreen layer, so it was a huge bomb, and was off the market in less than 8 months. Last year everyone was jumping on the Neonode infrared touchscreen bandwagon—Sony was first the year before, then came Kobo with the Kobo Touch, then B&N with the Nook Touch, and finally Amazon with the Kindle Touch. This year might be the year of the Flex Light ereader…even if the Nook Touch isn’t the first. One thing is clear: Barnes and Noble is going to release a new Nook soon, whether it has Flex Lighting or not. The Nook Simple Touch is nearing its one year birthday in June and B&N has been running sales on it all the time lately, especially the refurbished units on eBay (right now they are only $64.99). Lighting for the Nook Simple Touch would be a welcome addition…. …but FAR MORE ANNOYING than the lack of light is the crazy flashing of the display. Does the e-ink display have to refresh the entire screen whenever a few pixels change? I don’t think so. I think this is just an example of poor programming. Smarter programming would refresh only those portions of the screen that have changed, and leave the remainder of the screen unchanged. But who knows? Maybe there is something in the DNA of e-ink that mandates the flashing whenever I scroll. In any case, kudos to B&N for adding light to the Nook Simple Touch! I would LOVE it if this happens…wouldn’t hesitate to upgrade. I’ve been using the Nook Touch almost since it came out and still love using it. The display is easy on the eyes and I love having a device that’s a dedicated book reader. But one with Flex Lighting would be a dream come true. Very interesting. But I hope they come out with a red-light version (for monochrome screens of course). Much less obtrusive when your spouse is sleeping next to you…. It would be very close to perfection. I’d rather have the flex light with color e-ink, even if it on a washed out way. It would be the perfect tablet, as it would use a lot less energy than regular lcd screen tablet. A lighted screen would be really cool on the nook. I really hope that if they are releasing a new device they’re not going to go for the “Simple” game again. They really should open up some of those Android capabilities and rock the socks off everyone else. I’ll throw in a prediction for higher resolution for keeping up with the new iPad so that more information can be displayed on the screen (and a bigger screen would be nice too). …and hopefully all for $99? Ahhh, heaven! For my use, the Flex lighting would be a great feature/option. 1. Any idea of what the price point may be? 2. 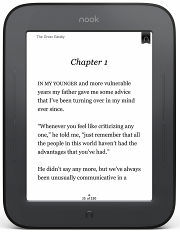 Does anyone know if this will become available on other ereaders as well, such as the Kindle Touch? I loved my Nook Simple Touch but had to return after the upgrade to 1.1.0 caused an incompatibility issue with my Study Bible. So, I went with the Kindle Touch and am really enjoying. But I may return if I can find out if future Kindles would have this same Flex lighting feature. I am within the return policy timeframe.